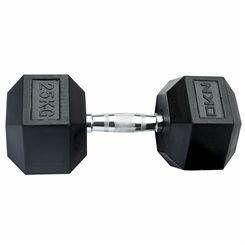 Get the results you want from your workouts with the DKN rubber hex dumbbells. Their quality hexagonal design prevents them from rolling away when not in use and the pinned cast iron rubber encased heads help to reduce noise and damage when placed on the floor for more pleasant workouts both at home and during light commercial use. Tone up your muscles, improve your strength and perform a wide range of effective drills and exercises with these excellent workout tools that are suitable for all users. 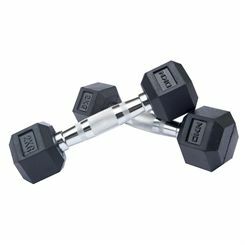 The dumbbells are robust and durable, easy and comfortable to grip thanks to their ergonomically contoured and knurled handles, and made to last and withstand your exercise sessions. 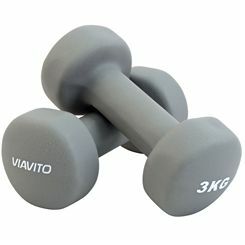 The Viavito 20kg chrome dumbbell set is a great fitness tool that will become an important part of your routine focussing on strengthening and toning your upper body. 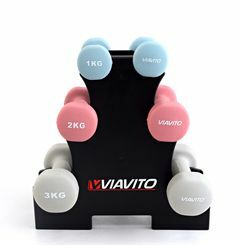 The set allows you to make two dumbbells weighing up to 10kg (22.4lbs) each, and they will certainly look the part in all home gyms thanks to their stylish sleek chrome design with an embossed Viavito logo and their weight in kilos on the plates. For targeting upper body muscle groups such as your chest, biceps, triceps, arms and back this set will be ideal, and they are tough, durable and have knurled handles so you can use them in confidence and with solid grip knowing they will withstand intense sessions. In the set you will find 2 chrome plated bars, 4 spinlock collars and 12 weight plates. Designed to enhance your strength training, the York grey cast iron hex dumbbells are suitable for both lower and upper body workouts. The dumbbells are great for beginners and seasoned lifters alike and allow for gaining more power, building strength and bone density and increasing muscle growth. They feature softened edges of the heads to prevent the paint from cracking and chipping and thanks to a hexagonal shape, the dumbbells do not roll away when not in use. 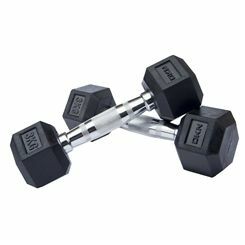 These robust dumbbells are produced from solid cast iron and have an embossed weight mark in kg for quick and easy identification. 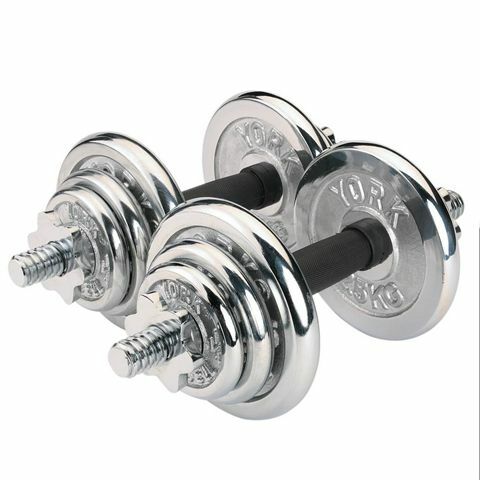 Great for strength training and effective upper body workouts, the York 20kg chrome dumbbell set is designed to help you get stronger, build power and gain muscle. This 20kg (44lbs) set includes 12 premium quality chrome weight plates ensuring versatile workouts, 2 dumbbell bars with ergonomic rubber grips for a firm and secure hold, as well as 4 spinlock collars that prevent the plates from rattling and provide added safety. This solid and durable set offers a robust construction and a stylish, eye-catching chrome finish. It comes with an inspirational colour exercise wall chart. Gain more power, strengthen muscles and tone your body using the NordicTrack adjustable dumbbells. 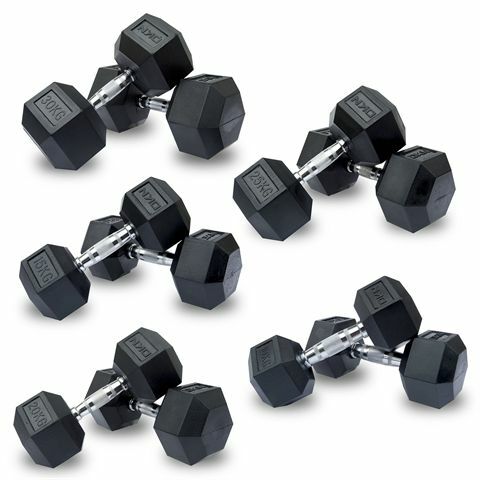 Perfect to make the most of a tight workout space, this solid and durable space-saving set replaces 5 pairs of dumbbells and includes stylish and stable stands. 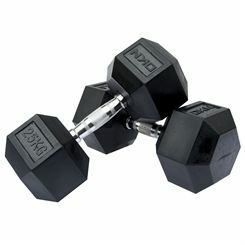 The dumbbells provide quick weight adjustment and help to keep your workout area organized. These robust dumbbells let you target muscles in your arms, legs and back and feature an innovative selector system enabling you to easily switch between workouts. The set offers the following weight increments: 2.5lbs (1.1kg), 5lbs (2.3kg), 7.5lbs (3.4kg), 10lbs (4.5kg) and 12.5lbs (5.6kg). Get stronger, gain muscle and achieve the mass you want with the PowerBlock Elite EXP Stage 3 add on kit. Designed to expand the PowerBlock EXP 70 set from 70lbs (31.7kg) to 90lbs (40.8kg) per hand, it lets you increase strength, tone up your body and improve balance and coordination. The 90 pounds kit offers a compact, space-friendly design to ensure convenient storage and replaces 28 pairs of dumbbells. This sturdy, durable and practical kit adds 6 additional increments to 70lbs set. It is supplied as a pair. Dumbbells are free weights and one of the most common pieces of fitness equipment you’ll find in gyms, studios and homes across the world. The reason for this? Well there are many, but simply put they are very easy to use, extremely effective and highly versatile. Weights have been used for centuries, if not millenniums, to increase strength and build up greater muscles mass, across all countries and cultures. The name in English might sound strange but it seems to come quite literally from its origins; the Oxford English Dictionary suggests that weights were used as a tool for practising bell-ringing, and as they made no noise they were called ‘dumb bells’. 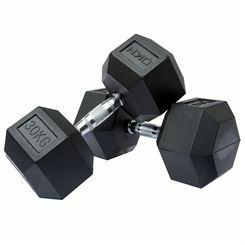 Their use for bell-ringing practise has given way over the years to fitness applications, and the modern dumbbell has a handle with the main mass that makes up the weight located on the two ends. You will find different types of dumbbells, but in general they can be categorised into 3 types. 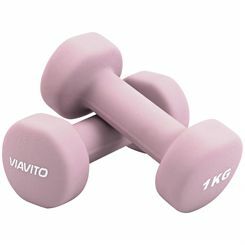 The first is fixed-weight ones, where the dumbbell is made with two equal weights on the end of the handle and the weight cannot be changed. These are very common and you can buy them individually or in sets. 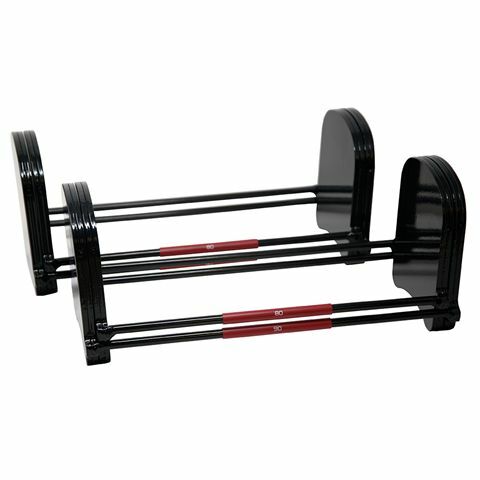 In gyms you will find racks with them ranging from as little as 0.5kg right up to 50kg or potentially even more. 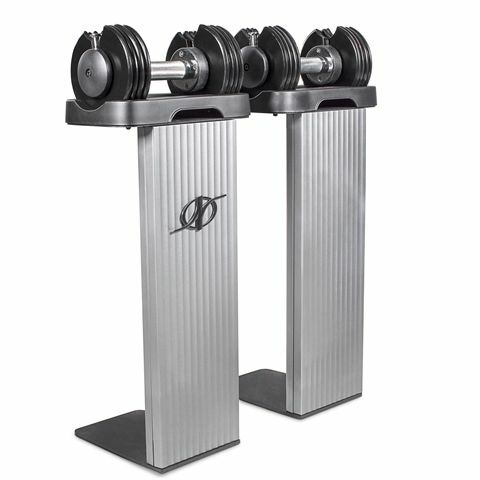 Adjustable dumbbells come with a metal central handle and open ends onto which you can secure weight plates – like a smaller version of a barbell bar. The plates are kept in place using either collars or ‘spinlock’ systems, with neither being better than the other but just a matter of design and personal preference. The third type, and probably the least common although certainly equally useful, is those which come in a block and allow you to select which weight you want to work out with. 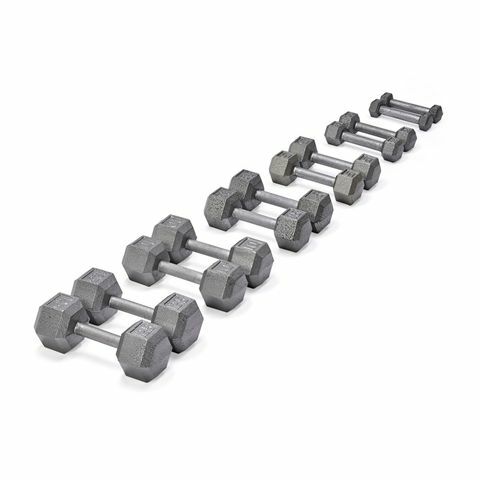 These selectorised weights are extremely practical, replacing the need for stacks of different weights of dumbbells, although they are a bit more bulky to exercise with. 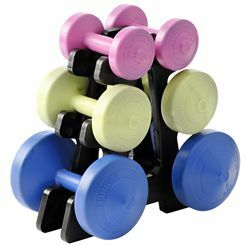 If you need a range of differently weighted dumbbells but are lacking in space, then these are an ideal option. 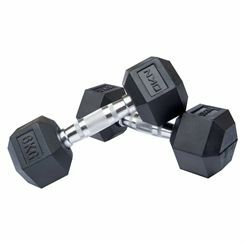 Dumbbells are generally made from cast iron but can have different finishes and exterior coatings, and the weighted ends can also come with different shapes and designs. Rubber and neoprene weights help to reduce noise and protect floor surfaces when placing them down between sets, making them great for home use. 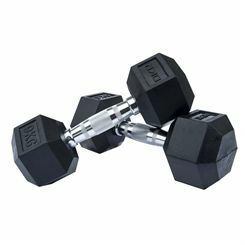 Hexagonal, or hex, dumbbells let you place them down without them rolling away, and rubber hex dumbbells are very popular. 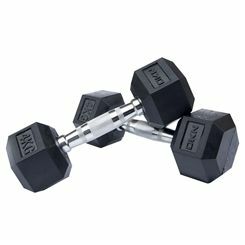 Rounded iron weights are very common and usually come in a black colour, something which you will see in commercial gym environments. And ones with a chrome finish will look stunning. 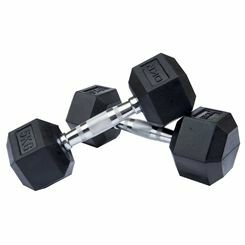 Why Use Dumbbells and what to do? 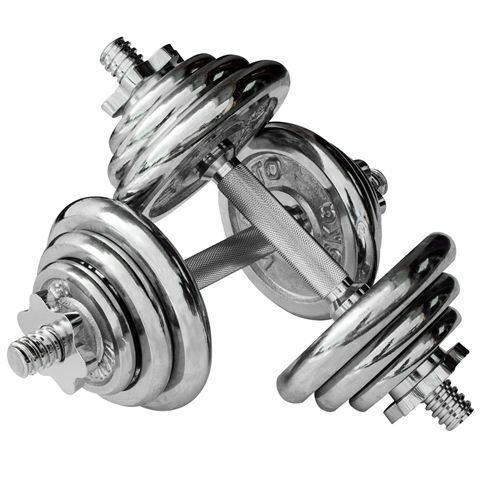 Dumbbell training is a highly effective way to tone key muscles groups, build strength and increase muscle mass. What’s more, exercising with dumbbells activates not only the main muscles themselves, but also the stabilising ones too which makes your workout more comprehensive and can help reduce the likelihood of injuring muscles. Dumbbells are very accessible. For those who work out at home, they don’t have to cost the earth at all, but are a very cost-effective fitness accessory that can deliver the same outstanding results as gym workouts. And for gym-goers, every gym will have a wide range of weights to use and to use people of all levels of fitness and strength. Dumbbell workout routines will also fit in well to those people following weight loss programmes. It might be a bit daunting, first not knowing what to do with them and second because other people seem to lift much heavier weights that you are capable of, but don’t let this put you off. Even adding a couple of kilograms of weight to any exercises you do will have a big impact, increasing the resistance against which your body moves. Men and women can use dumbbells to enhance their fitness routines and target muscles that can be difficult to work doing other exercises. Giving you a great range of motion on all exercises, dumbbells will suit 100s of different reps and drills and are certainly not just for your upper body. Whilst many people know that they can be used for curls, presses, raises, rows to target the chest, arms, shoulders and back, pick up a pair when lunging, squatting, doing jumps, deadlifts and plenty of other lower body or total body exercises. With dumbbells you can perform one arm at a time or both together, letting you ease into exercises or specifically work each side harder and more attentively. Using two dumbbells together also gives you a mental challenge, engaging your brain more as you train. And whilst barbells are exceptionally good strength tools, because you’re not restricted by a long bar you can usually take each rep with a dumbbell deep and work a greater range of each muscle. 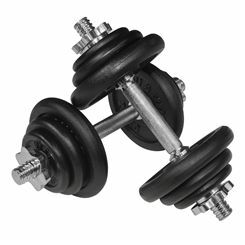 So if you feel that dumbbells are for you, then have a browse of our range above on this page. At Sweatband.com we sell weights from all the top brands, giving you the best choice and fantastic prices!